Experienced London estate agent, Karl Knipe, with over 30 years’ experience in the industry, is hosting the LGR’s series, “The Property Show.” Karl, partner of Kings Group (15 branches across North London, East London, Hertfordshire, and Essex), discuss a variety of issues each month, ranging from house prices and Brexit, to stamp duty, and the buy-to-let market, as well as, wealth management. Karl is joined by experts of various sectors in the industry. Stuart has been with the Kings Group since 2007. During these 11 years, he worked predominantly in the Edmonton area and has become as synonymous with Edmonton as, The Green itself….! In 2018 Stuart was nominated for an individual award for Customer Service at the prestigious ESTAS (Estate Agent of the Year Awards)! Philip is a Director of Strettons, a well-established north-east London based firm of Chartered Surveyors and Auctioneers. He has been with the firm for over 30 years, he first debuted on the auction rostrum in 1994. Philip has been running the auction team for the past 10 years, and overseas the sale of about £80 million property a year, comprising a wide range of land and buildings in London and around the UK, and sometimes further afield, including Cyprus where Strettons have held several auctions. Stuart is a Business Development Manager at Pattinsons, the UK’s fastest growing online auctioneer. He has been with the firm since June 2018, he works in property auctions for the past 11 years in London, the South East, and Bath. Stuart has been involved in the sale of over 3,000 auction lots, across the length and breadth of the UK, including public toilets and a country mansion – and everything in between! London Greek Radio are excited to announce that Greek singer Konstantina will be performing live at the Penridge Suite on 25th November 2018. Join us for our dinner & dance featuring a live performance by Konstantina & her musicians. Including George Gregoriou on bouzouki, Nikos Savvides on guitar & Giannakis on Keyboard. It’s a night not to be missed! Tickets are £35 & £40. For more information call London Greek Radio on 020 8349 6950! Address: 470 Bowes Road, London, N11 1NL. Door open at 6pm, dinner will be served at 6.45pm. 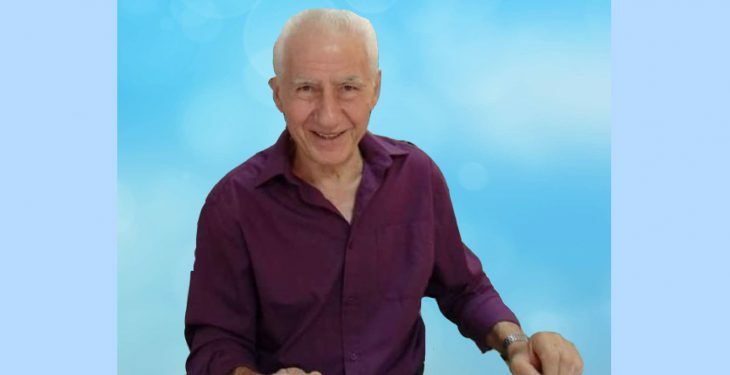 It is with deep sadness that we announce the passing of London Greek Radio’s co-founder Akis Eracleous on Thursday 18th October 2018, at the age of 66. 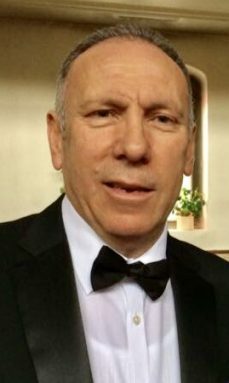 Akis Eracleous was from Famagusta, born on the 26th of December 1952 and came to the UK at an early age, where he attended Islington Green School in London. In 1983, Akis felt there was a need for a Greek radio station to give a voice to our community. No one could have imagined the success of London Greek Radio (LGR) as a pirate/unlicensed station. 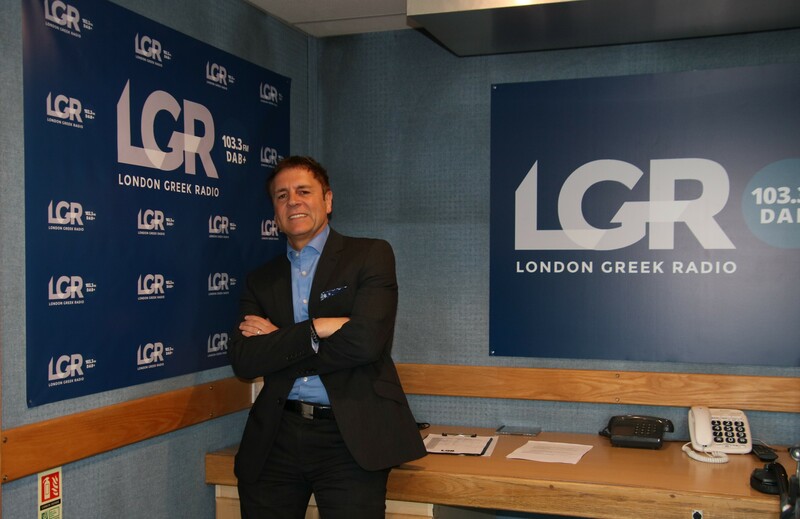 Thanks to his devotion, determination and continuous battles to keep the station on air, LGR became the WORLD’S first Greek Radio Station to obtain an FM licence in 1989. This was achieved after Akis sold KISS FM, as he believed that providing the community with a platform was integral. Akis was one of the iconic presenters during the 1980’s and quickly found fame within the Greek and Cypriot communities. He continued his work when LGR was licensed in 1989, serving as a Director, Managing Director, Station Manager, Shareholder, but most notably, hosting the long-running mid-morning show, “Ligo Prin To Mesimeri” on weekdays. Akis championed the modernisation of the station to bring it into the 21st century. He was a mentor to the upcoming younger generation of presenters and helped them to establish themselves as household names within the Greek and Cypriot Communities. Akis, also known as ‘George Power’, found fame on the British soul scene in the 1970s and 80s as a resident DJ at Crackers Nightclub on Wardour Street and The Electric Ballroom on Camden High Street. George was an essential and influential DJ on the London Club Scene. Making a name for himself at the legendary Crackers on Friday afternoons and Sunday nights, George had a massive following from the regular “soul-boys” to the trendy celebrities – even Gary Kemp (Spandau Ballet) was spotted in the club. His Roller Disco’s at the Electric Ballroom on Wednesday nights with Paul “Trouble” Anderson and his Double Disco on Friday nights with Gilles Peterson were a huge success in the mid-eighties. It cannot be understated how important George was to London’s clubs in the 70s and 80s. In 1993, he founded the “Nice ‘N’ Ripe” record label, which is renowned as one of the leaders in the birth and growth of the scene called “UK Garage”. In 2012, whilst leading LGR, Akis re-branded his 1970s ‘Soul Crackers’ and created Crackers Radio, online and on DAB, which he continued to manage until his sudden, unexpected death. He was the original founder of the famous Kiss FM and presented shows on many radio stations, including Invicta Radio and City Sound Radio. During the occasions when LGR was taken off the air, he launched Sunshine Radio, an English-language service on the Cote D’Azur in the South of France. He was truly a pioneer of British radio. The legacy left by Akis Eracleous will live on. Akis was a loyal loving family man, lifelong Arsenal fan and passionate season-ticket holder. His unique sense of humour and vibrant laugh will be remembered by us all forever. The management and staff at London Greek Radio are all deeply saddened and shocked to learn of Akis’ passing and sincerely express their deepest and sincere condolences to his wife Julietta, his sons Emilio and Marko, his daughter Eva, his sister Androulla, his nephews Marios and Venizelos and his family and friends. Details of the funeral will be announced soon. The Ministry of Transport in Cyprus has issued an announcement giving instructions to passengers affected by the cease of operations of Cobalt air Ltd. According to the announcement, passengers that were due to fly on the 17th or 18th October 2018 on the cancelled Cobalt air flights, are kindly requested to secure a single one-way Economy Class ticket for their repatriation. Passengers will have to present the evidence of their booking (boarding pass, receipt) to the Accounts Department of the Ministry of Transport, Communications and Works. For more information in regards to how and when the claim will be made, a subsequent press release will follow. Alternatively, passengers that were due to fly on the cancelled flights of the 17th and 18th but have not yet issued any tickets may call at any of the telephone numbers below to assist them in issuing a one-way ticket for their repatriation. Passengers who purchased tickets by Debit or Credit Cards can contact their Banks for information regarding possible reimbursement. The Ministry of Transport would like to clarify that the above arrangements do not constitute legal obligations of the Republic of Cyprus, but they are undertaken in an effort to facilitate the stranded passengers. Experienced London estate agent, Karl Knipe, with over 30 years’ experience in the industry, is hosting LGR’s series, “The Property Show”. Karl, partner of Kings Group (15 branches across North London, East London, Hertfordshire and Essex), discuss a variety of issues each month, ranging from house prices and Brexit to stamp duty, and the buy-to-let market, as well as, wealth management. Karl is joined by experts of various sectors in the industry. John Toth; Partner in the Trusts and Estates Team at Ashfords solicitors. John advises on many aspects of private client work such as the creation of Wills, lifetime tax planning for individuals, preparation of Lasting Powers of Attorney, also advises the estates of deceased persons on the best way to realise assets, negotiates with HMRC to ensure that the correct amount of Inheritance Tax is paid, drafts new Trusts and advises Trustees on complications which arise with their trusts and how to remedy them. Simon Todd; a Chartered Tax Adviser with over 25 years in professional practice. Prior to founding, Engaging Tax, he was Head of Tax with the wealth management arm of a premier global wealth management firm. Simon has a thorough and detailed understanding of Income and Capital Gains Tax Planning and structuring for UK resident individuals, as well as those who are resident but non-domiciled. Simon’s particular expertise is managing the past, present and future tax consequences of esoteric investments such as film finance partnerships and a variety of property based structures. Bobby Bhuiyan; Financial Adviser for Thomas Oliver LLP, part of the Openwork network. Bobby protects and enhances his clients’ wealth, helping them to find solutions to their financial needs. He specializes in 4 key areas; Tax efficient investment planning, Lending services, Protecting clients assets with Trust planning and life insurance, Connecting people who need specialist advice. 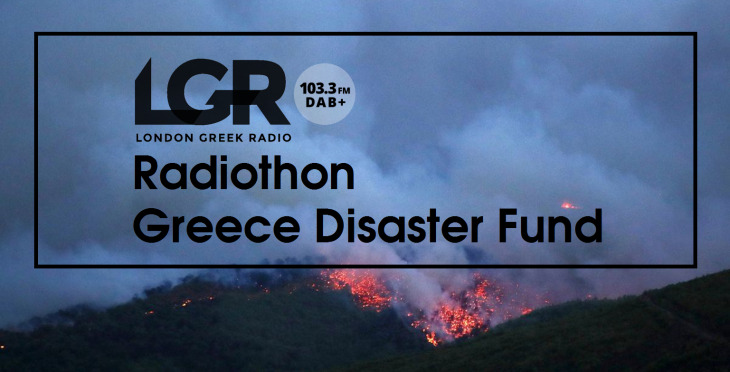 LGR launched a Radiothon “Greece Disaster Fund” this month with the participation of other community media, to help collect funds as part of efforts to help Greece deal with the after-effects of last month’s devastating fires. The Greek/Cypriot community rallied to help in wake of the deadly blaze, as it responded to a 12-hour fundraising appeal on 6th August, urging listeners to donate generously to the worthy cause. The informative and entertaining Radiothon was hosted by LGR presenters with several guests featured. 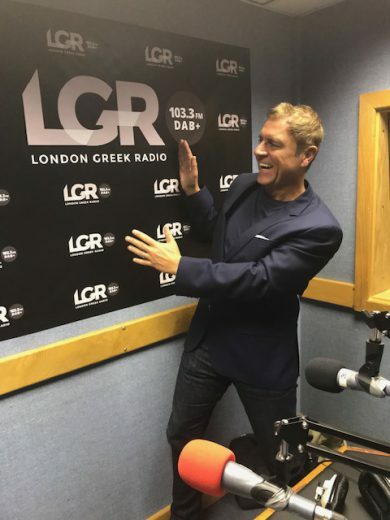 The presenters echoed what the General Manager said in doing whatever they could to support the victims, through London Greek Radio’s modest efforts. The rotating ‘on-air’ studio team comprised of Sofia Tsoulaki, Vasoula Christodoulou, Vasilis Panayi, Pierre Petrou, Tony Neophytou, Katerina Barotsaki and Chris Theoharous. A steady flow of visitors had responded well to the appeal, throughout the day including; Christos Karaolis, the President of the National Federation of Cypriots in the UK; the new Deputy High Commissioner of the Cyprus Republic, Nicholas Manolis; His Eminence Archbishop Grigorios, of the Greek Orthodox Archdiocese of Thyateira & Great Britain; the first UK Cypriot Parliamentarian, Bambos Charalambous, MP for Southgate-Enfield; the General Secretary of AKEL and Managing Director of Parikiaki Newspaper, Bambos Charalambous; and the man in charge of Hellenic TV, Chris Fellas. British-Cypriot songwriter and producer John Themis and Vangelis Polydorou, a finalist of The Voice UK 2016, both urged aid assistance to help the survivors rebuild their lives, following the national tragedy. The talented singers within our community also added their voice to the cause with Giorgos Gerasimos, Elizabeth Chapman and Roger Grech solidly boosting the Radiothon, as they joined the three-hour Drive Time show, again demonstrating that it’s the collective community initiative that works. All the money you donate will go towards those in need and affected by this tragedy. Everyone at LGR thanks you for your tremendous support and help. Those wishing to support London Greek Radio’s response to the Attica wildfires can do so with a donation at the Bank of Cyprus UK “Greece Disaster Fund”. >Online using internet banking with another bank. Andreas Kapetanios, the former goalkeeper for Orfeas Nicosia FC, has died suddenly in Larnaca at the age of 79. He was the main goalkeeper for Orfeas FC between 1959 and 1963; it’s most successful-ever period in the club’s history. Born in Myrtou in 1939, a young Andreas grew up to become one of Cyprus’ leading goalkeepers and a massive credit to Orfeas FC, who have never returned to the Cypriot First Division since Andreas left them in 1963. His distinguished and captivating appearances, spectacularly saving goals during his time at the club have seldom been replicated in Cypriot football. At the end of the 1962-63 season, Andreas joined Pezoporikos Larnaca FC, where he stayed from 1963 to 1968, continuing to impress spectators and football pundits with his goalkeeping abilities. After retiring from professional football, Mr Kapetanios moved to England at the age of 29, where he started a new life getting married and raising a family in north London. 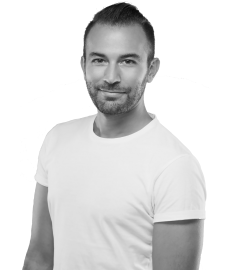 Andreas was a hard-working Senior Bodyshop Technician repairing vehicles for twenty-five years in London before semi-retiring back to his beloved Cyprus in 1993. He continued to repair cars, as well as closely watching football developments in Cyprus and the UK. In 1996, he suffered a heart attack and was flown back to England, where he underwent a quadruple heart-bypass at Harefield Hospital in London. For the last twenty-five years, Andreas lived in Larnaca, however, his love of football never stopped and he continued to enjoy the Cypriot league, as well as the UK’s Premiership, having been a West Ham United supporter during his time in England. In later years, Mr Kapetanios enjoyed travelling between Cyprus and England visiting his adult-children and grandchildren. Andrew Kapetanios died peacefully in his sleep on the feast day of the Assumption of The Panayia, (Holy Virgin Mary), on Wednesday, 15th August. He was 79 years old and his survived legacy includes his wife, two adult children, two grandchildren, and his extended family. He will be laid to rest on Saturday, 18th August at 12 o’clock, at St George’s Church, Pentelis Street, Larnaca, Cyprus. LGR extends its sincere condolences to Andreas Kapetanios’ family including our very own Pierre Petrou, one of Andreas’ nephews. 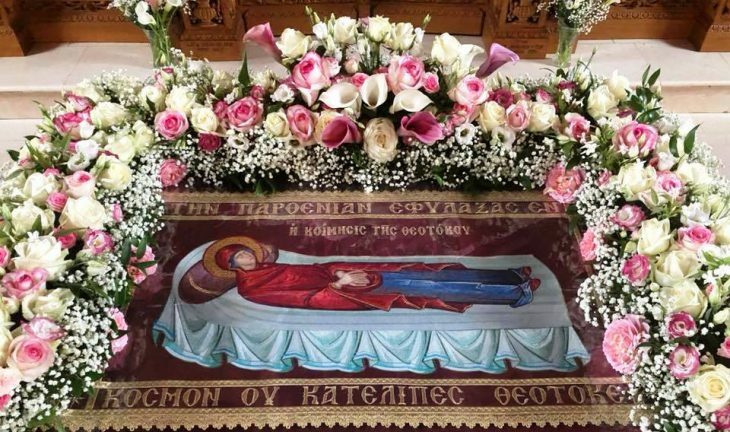 Greek Orthodox Christians celebrate the Feast of the Dormition of the Theotokos or the Dormition of the Most Holy Mother of God on August 15th or Dekapentavgoustos each year. It is a national and religious holiday in Greece and Cyprus and the Greek/Cypriot community in the UK, with attending Church liturgy. That marks the “falling asleep,” repose or kimisis of the Virgin Mary, mother of the Lord Jesus Christ. The Feast also commemorates the Assumption of the body of the Theotokos into heaven. The Greek Orthodox believe the doctrine of the Assumption, which teaches that at the end of her life, Mary, the mother of Christ, was taken body and soul (i.e. both physically and spiritually) into heaven to live with her son Jesus Christ, forever. His Eminence Archbishop Grigorios the Greek Orthodox Archdiocese of Thyateira & Great Britain is expected to be at St Mary’s Greek Orthodox Church, in Trinity Road, Wood Green, this Wednesday morning’s liturgy. The service/liturgy starts at 9 am. Thank you to Fr Joseph Paliouras from The 12 Apostles, Greek Orthodox Church, Hertfordshire, for this beautiful picture, 15th August 2018. Forty-four years ago to this day the Turkish military launched its second offensive against the Republic of Cyprus, in full violation of international law, including the UN Charter, despite the ceasefire that had been agreed. Christos Karaolis, the President of the National Federation of Cypriots in the UK on Sunday gave a speech at St John the Baptist Greek Orthodox Church, Wightman Road. 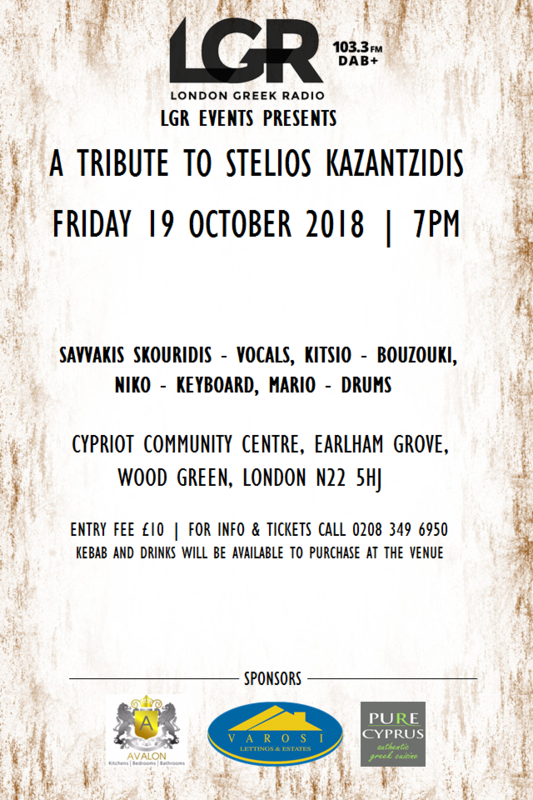 As the London Cypriot community comes together, with events like these, honouring the tragic chapter of Cypriot history. He was formally invited to AKEL in Britain annual memorial service condemning the EOKA B Junta attempt to overthrow the Cyprus Government and the Turkish invasion of Cyprus in 1974 and in memory of those who lost their lives during this period. The Turkish side continues to disregard calls by the international community relating to Cyprus and continues to hold the city of Famagusta hostage of its illegal military occupation. Dubbed a “ghost town”, Famagusta’s fenced off section – called Varosi – remains to this day deserted, abandoned to the elements. Turkish troops invaded Cyprus on July 20, 1974, five days after the legal government of the late Archbishop Makarios III was toppled by a military coup, engineered by the military junta then ruling Greece. Two unproductive conferences in Geneva followed; the first between Britain, Greece and Turkey and the second with the additional attendance of Greek Cypriot and Turkish Cypriot representatives. Three weeks after the ceasefire of July 22, and despite the fact that talks were still being held and just as an agreement seemed about to be reached, the Turkish army mounted a second full-scale offensive. As a result, Turkey increased its hold to include the booming tourist resort of Famagusta in the east and the rich citrus-growing area of Morphou in the west. All in all, almost 37% of the territory of the Republic of Cyprus came under Turkish military occupation. Nearly one-third of the population, some 200,000 Greek Cypriots, were forcibly uprooted from their homes and properties, thousands were killed during the hostilities, over 1,000 persons were listed as missing while thousands of Greek Cypriots and Maronites remained enclaved. The latest effort to reach a Cyprus settlement was concluded last summer in the Swiss resort of Crans-Montana without result. Cyprus since then, President Nicos Anastasiades repeatedly said that he is ready to return to the negotiating table if Turkey accepts the termination of guarantees and intervention rights and is ready to withdraw its troops from the island.